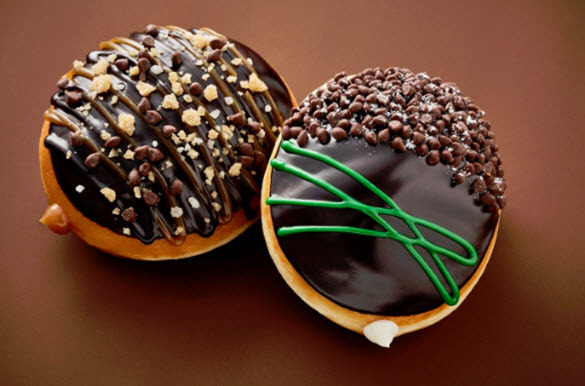 Krispy Kreme has unveiled two new Ghirardelli chocolate varieties of its doughnuts. They include the Mint Chocolate and Sea Salt Caramel doughnuts. They arrived at Krispy Kreme locations earlier this week. Jackie Woodward, Chief Marketing Officer of Krispy Kreme Doughnuts, says in a statement, "Uniting premium chocolate enthusiasts and our beloved doughnut fans, these doughnuts offer an OMG-worthy reward any time of day – whether you're celebrating life's everyday moments or in search of a delightful afternoon indulgence." The Sea Salt Caramel Doughnut was inspired by Ghirardelli Chocolate Sea Salt Caramel Squares. It is filled with a salted caramel filling. The Mint Chocolate doughnut is filled with a white mint cream filling inspired by Ghirardelli Chocolate Mint Squares. Krispy Kreme says the new dougnuts will be available for a limited time at participating locations.